How to build self-reliance and self-esteem in your child? 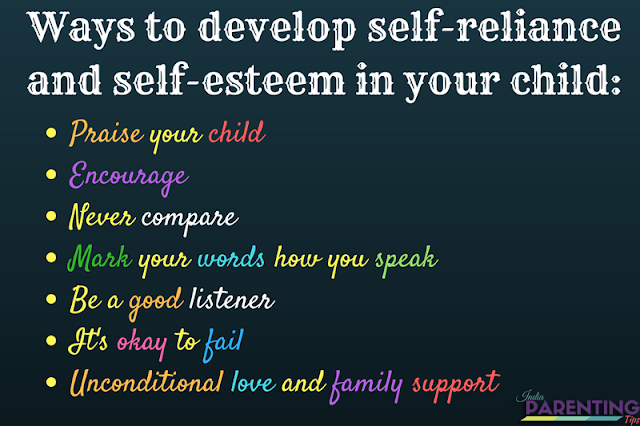 Building self-esteem and self-reliance is a lofty idea for every parent to achieve for their child. Moreover, this concept has so much wrongly applied and used in almost every topic related to building personality development that I feel that its essence perhaps is lost. This article aims to bring forth the basic understanding of what self-reliance and self-esteem mean first and then to evaluate and understand its practical implications in day to day life for the children. Lastly, I would like to talk about how to develop and build self-reliance for our children that would remain as an asset to them forever. The dictionary defines self-reliance as something related to being self-sufficient, self-supportive and dependence on one's own inner strength and potential rather than depending on others. In short, it is a kind of independence and freedom of accepting what we are and doing our best with our potential. It is opposite to dependency which involves actions and reactions of other people. Self-Reliance means self-awareness. Awareness of one's own strength and weakness is very important for all of us to know what we are good at and what needs more practice and time to achieve the target. When I was a child I was asked to write the strengths and weaknesses of my self as a homework in my value education class. I used to feel that was such a boring task then. Anyways, since it was an assignment to be completed I had to find fill the black pages with my thoughts. In the process, I had realized many things unknowingly. I came to know what I am good at actually. I had realized what are my weaknesses. Interesting on the day of submission our teacher added a twist. She gave another paper and asked us to write about the strengths and weaknesses of our sitting partners in the classroom. Although it was a funny and lively experience for me, for some of my friends it was very embarrassing and not so happy experience. It was then our teacher told us about self-reliance and self-awareness. It was a very eye-opening class which I still remember. Self-reliance and self-esteem mean knowing oneself with strengths and weaknesses. It means to value ourselves with our own potentials that we possess. Self-reliance is accepting one's strength as well as weaknesses. Self-reliance and self-esteem mean trying to maximize our inner potential rather than harping on the weakness. Self-awareness and self-reliance do not mean comparing with others and trying to compete with others. It means to value our own ability while accepting our limitations. It also means accepting the actual idea that no one is perfect. God created all of us with strengths and weaknesses. We need not secure Grade A plus in all aspects of our life. Self-reliance also means accepting others as they are as we know we are not perfect. It ensures that other people feel happy and safe in our company. 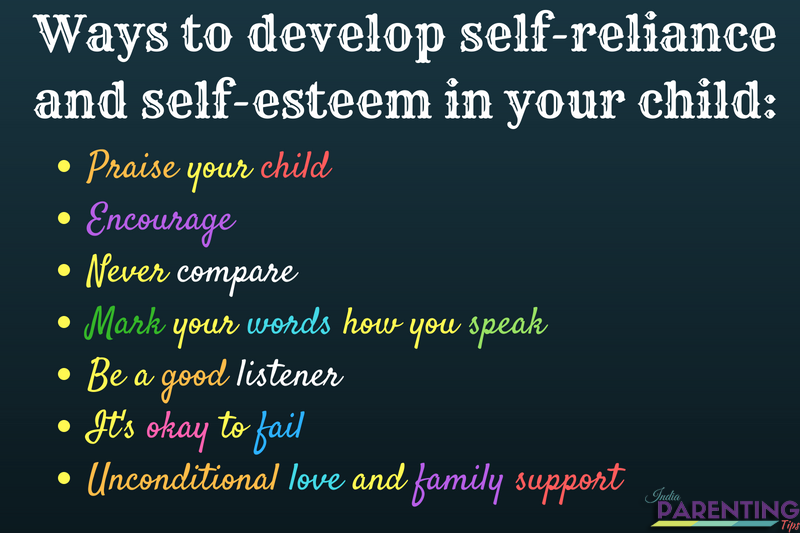 How to develop self-reliance and self-esteem in your child? Building self-reliance and self-esteem is not a one week or one-month course that we much complete to achieve our target. It is an ongoing process for children that takes years to build up gaining strength over the period of time giving more positive results. However, it is never too late to start as indeed it is an essential part of a child's personality development. Praise your child: Praising your child for every good deeds and achievement is very important in character building and personality development. We must remember it should be genuine praise and not false praise. We must praise when there is a genuine effort or achievement that we see and not just saying things for the sake of saying. This builds confidence and self-esteem in the child and he or she understands his strengths and positive effort. Encouragement: Ensure that you always encourage your child and keep him or motivated to do more better. Acknowledge his or her effort that he or she has taken and let him or her know that he or she is doing great. You've really made it that great! Never compare: This should be a thumb rule. Do not ever compare your children with others. That's a very negative thing that you can do that does no good for your children. It does not improve competitive skills. It creates depressions, sadness, giving up attitude and takes away self-esteem and self-reliance from your child. Remember God has made every one of us: No one is perfect. We are humans after all. It's our strengths and weaknesses that make us what we are and we need not be perfect in every way. If your child lacks interest or knowledge in one field, he or she must be good at something else. Instead of cribbing, coaxing, nagging on what he or she is not good at, find out what he or she excels in. God always creates things in balance and they are perfect in their own ways. The problem is that we cannot understand and recognize that a perfectly balanced equation which He creates for us. Mark your words how you speak: Words are medicines and words are weapons as well. You need to be very careful when you speak to your child. Your words and actions mean a lot to him or her. Above all, he or she sees the world through your eyes initially. Please do not give judgments and label children. You may not how badly it hurts them and demotivates them taking away their self-esteem and self-reliance. Example: Instead of saying Kim has such a poor memory, say Kim was finding it very difficult to remember where he had kept his pencil box. Talk about the particular issue or behavior rather than labeling them or branding them with your judgments. Be a good listener: Giving quality time to your children is very important. I know it may be easy every time and every day. However, daily we should dedicate at least 30 to 45 minutes of our time to our kids solely to listen to them. Listening helps and heals. It's okay to fail: Remember we can't be a jack of all trades being master of none. Let your child be free to do whatever he or she wants. Even if she or he fails, let him learn to dust off the failure and stand up once again to pursue his or her dream. As parents, we often force our children to fulfill our dreams and expectations which we could not achieve. In the process, we put a lot of pressure on the child which makes him or her lose his or her self-reliance and self-esteem. Unconditional love and family support: Every child deserves to live in a loving and compassionate family which is a safe haven for their peaceful growth and development. Ensure that your child gets a blissful, safe, family environment that is supportive to foster his growth and development. In case you don't have one, make sure to create one for your child. Nothing is impossible if you think and act properly. You need to have rules in the house and that should be followed. However, make sure that your child knows that your love for him or her has no limitations and it is unconditional no matter what. Give space: Ensure that you give enough space to your child to develop his or her own identities and understand his or her potentials. Do not hover around him or her all the time as helicopter parenting. Maintain a good balance between protection, safety, and freedom. Above all children need to learn to walk by themselves and fall sometimes in order to grow up. However, if you think that your child might need help and is struggling with self-reliance and self-esteem, do not hesitate to take help from a psychotherapist and act as per doctor's advice. 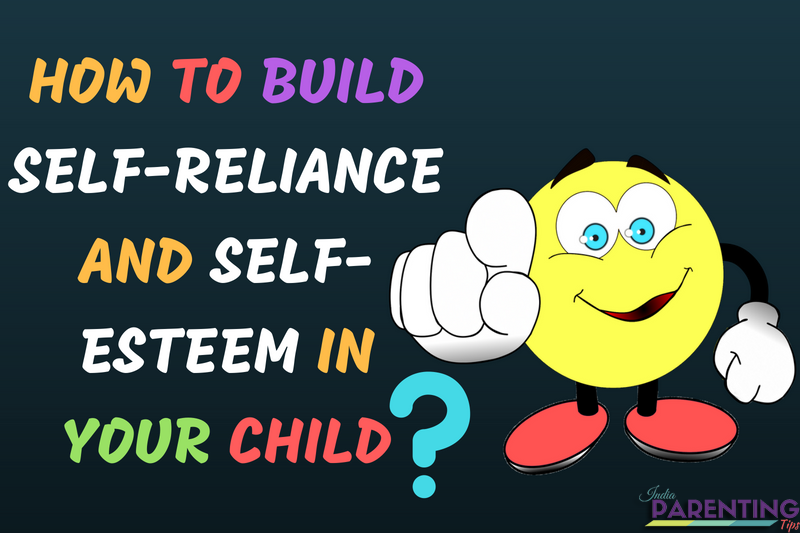 Building self-reliance and self-esteem is an ongoing mission for the parents that needs lots of patience and positive thoughts. This cannot be achieved overnight for children or even for adults. It takes time to build up brick by brick like a foundation of a strong building. Ensure that the building blocks are placed with lots of love and compassion and not out of pressure and force. Give time and effort and I am sure with all the tips that I had discussed in this article you can achieve your desired goal. In the process I am sure, we as a parent would also learn and develop self-reliance and self-esteem in our lives. All living things grow after all! Just because we are adults, it does not mean we have stopped growing!